Lavender Ridge: THIS IS SPRING? Just outside our kitchen window, this is spring? 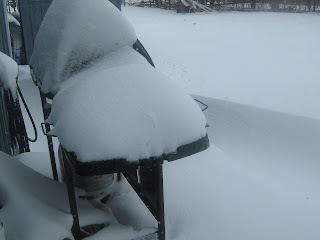 It snowed all day yesterday and overnight. Just south one hour drive it only rained. Lucky Us!!! How will the Easter Bunny find us?? I sure hope it warms up by the weekend. Linda, all the snow does not say it is spring....more like winter. I am sure the Easter Bunnie will find you. Just leave her some snow footprints outside at your door. OMGoodness, and I thought we got a lot. 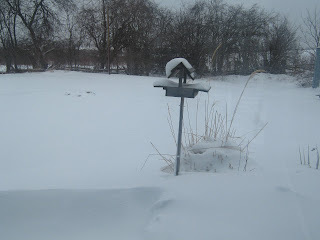 It also snowed last night and today, but we only got a couple of inches and as of now, in the middle of the afternoon, there is hardly any left. Hope it melts for you to! Linda...we had rain..a lot. Now down to 33F tonight!!! Just not a normal spring for us here in coastal southern VA either!! Just glad was not SNOW! I hope this is the last one for you all!! That's quite a bit of snow you have there. Better you than us! Thank goodness we've only had rain. 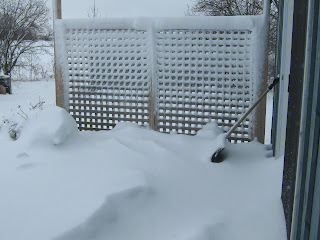 I don't think I could handle another snowfall. Hopefully it'll be gone by the weekend. We have had a crazy spring too. We had snow flurries today and in the 30's colddddddd Burrrrrrr. Hang in there it will come.